One of the criteria for a successful halloween costume is being a thing that people LOVE here. If you are on stage, showing off to a crowd, the audience is applauding as much for what you represent as they are cheering for your rendering of the costume. Previous costumes have included a box of See's Candy, a Dwight Shrute Bobblehead, the Money you Could be Saving with Geico and a Fandango Paper Bag Hand Puppet. This year I couldn't resist creating a wearable version of something that almost everybody loves: Disneyland. 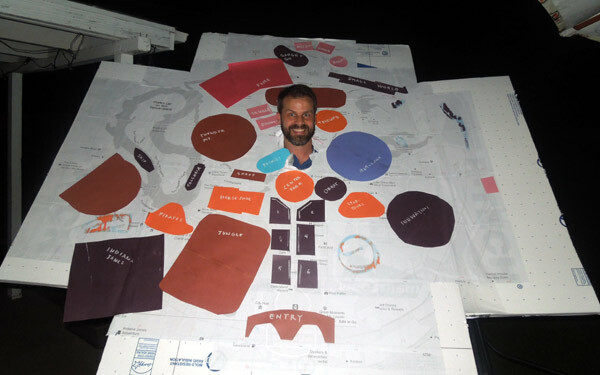 My plan was to wear a map on my shoulders, not parallel to the ground, and not perpendicular to the ground either. I'd wear it at a steep angle, so that kids would have a better view of everything. The first questions were 1) How big should it be, and 2) where will my head go? The default size for my halloween costume is "as big as possible", which is determined by two factors: the size of the SUV I use for transport and 2) the size of the doors I have to get through to get on stage. Any venue with doorways narrower than 31" are out of the question, owing to the size of my ego. I settled on 6'5" as the maximum depth of the main platform. That would allow me to manouver it through regular doorways with relative ease. 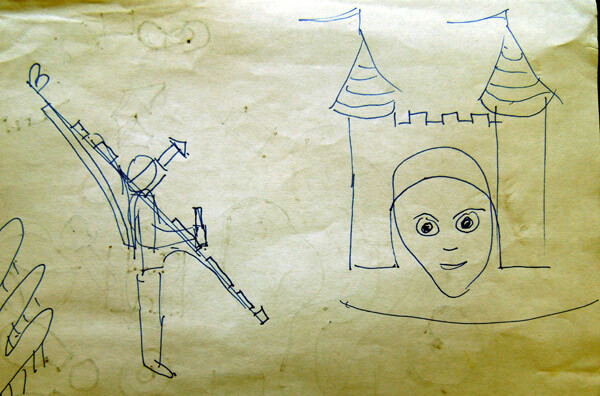 After considering using the Matterhorn as the central focus of the costume (where my head would go), I accepted that Sleeping Beauty's castle would have to be the center of the costume, and that it would make the most sense as the place where my face and head would occupy the map. 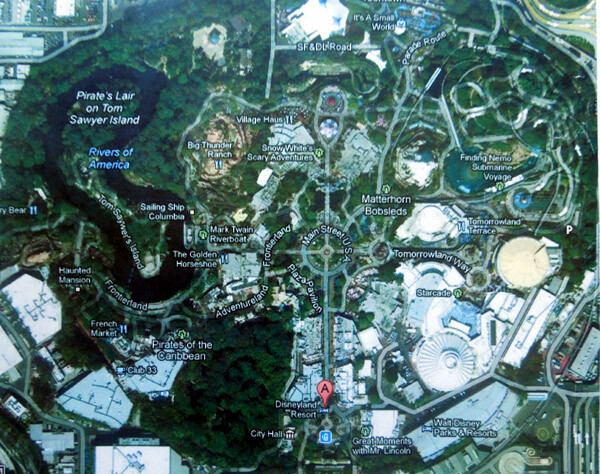 Actual satellite maps of Disneyland are somewhat disappointing. There are wide avenues and trees, and plenty of regular buildings and warehouses. 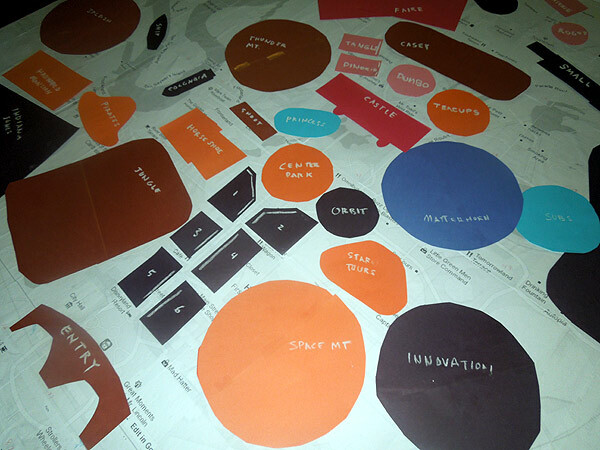 I wanted an augmented reality, highlighting the good stuff. 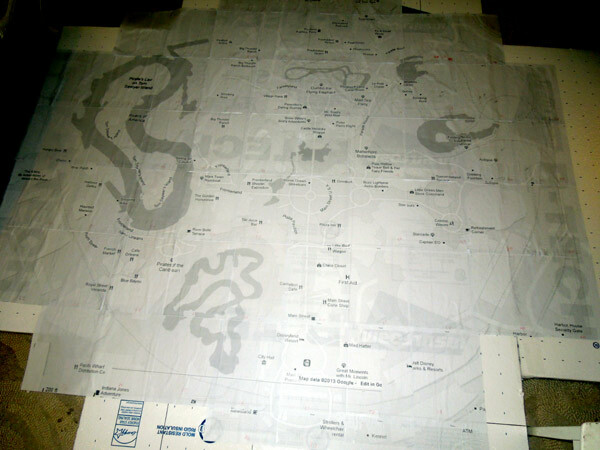 But I started with that satellite map, just to get my bearings on the lay of the Disneyland. 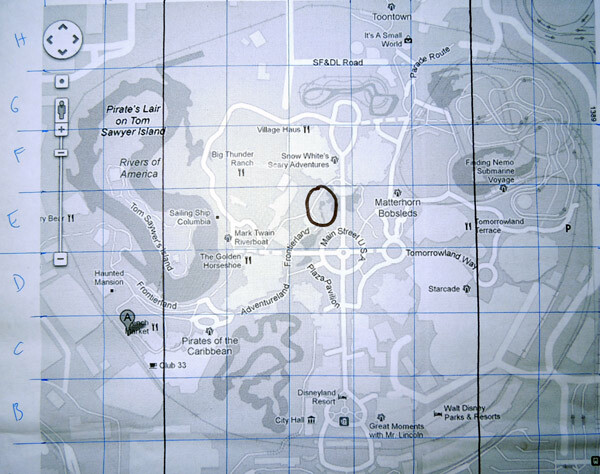 The map above was sectioned off into a grid. 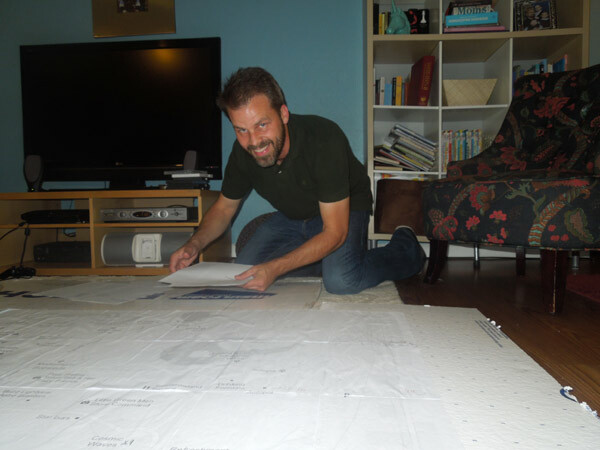 I used Adobe Fireworks to print out a giant version of the map across 70 sheets of paper. I glued these down in place on a large (6½' x 4') sheet of styrofoam. The sheet wasn't wide enough, so I added two wings to the side to make it about seven and a half feet wide. 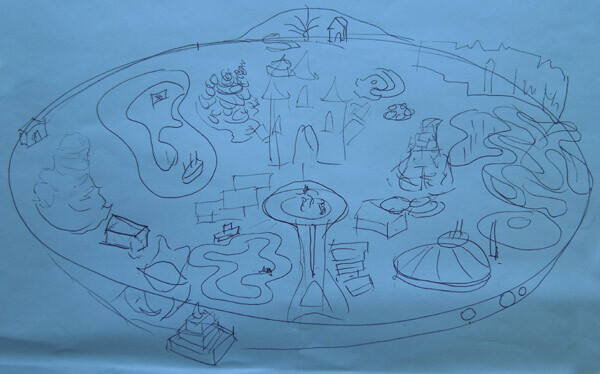 Next I had to figure out which attractions I would actually create, and how large they could be. What I wanted was a three dimensional map with the important attractions and landmarks built scaled up and almost bumping into one another. 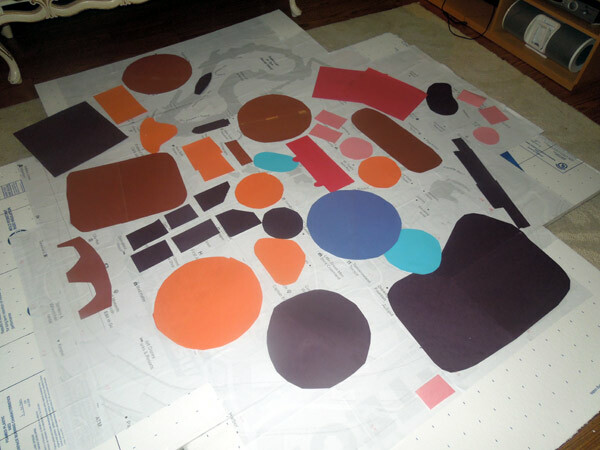 I started experimenting with construction paper shapes, almost all of them were oversized. With everything jammed in together, It looked awesome! I couldn't wait to start building tiny versions of Thunder Mountain Railroad or the Jungle Cruise. With the construction paper plan in place, I popped a hole into the styrofoam, just in front of where Sleeping Beauty's castle should be. I would wear her castle as a hat. Now all I needed were some Jungle Cruise trees and a waterway, an entryway for the Pirates of the Carribean, a Haunted Mansion, a Splash Mountain rollercoaster, Rivers of America, Thunder Mountain railroad rollercoaster, some main street buildings, the Walt Disney statue, Sleeping Beauty's castle and moat, the Toon Town sign, Gadget's Go Coaster, some railroad tracks, the pavillion tent, a submarine lake, the Autopia roadways, the Matterhorn rollercoaster, a Star Tours sign, Space Mountain, the tea cups, King Arthur's Carousel, the Dumbo ride, the Small World facade and the Indiana Jones Temple.